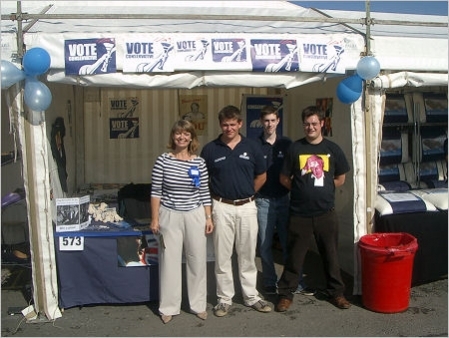 This weekend, Conservative parliamentary candidate Harriett Baldwin and members of Conservative Future held a stand at the Malvern Autumn Show. They were there to hear the views of local people and the agricultural community. They received a very positive response from the public, who were pleased to be able speak to and raise their concerns about local issues with Harriett. Many were also encouraged to see young people getting involved in politics. Conservative Future Chairman, Joe Smith said "We got a fantastic reaction from everyone we spoke to, they were delighted to see us there. One of our main goals is to show young people that they can be involved in politics and make a real difference." Many members of the public expressed their concern at the current government and the crisis of leadership facing the Labour party. They also talked about their anger at how they have been let down, a major gripe was the provision of NHS services within the local area. Conservative Parliamentary candidate, Harriett Baldwin said "We got a fantastic response to our question asking people to guess the date of Tony Blair's resignation. The most popular reply was Yesterday." The show once again proved to be a great success for both the local community and economy. West Worcestershire Conservative Association will now be taking forward the feedback they received from the public and look to campaign on it going into the local elections next May. Photo: Parliamentary candidate Harriett Baldwin with local Conservative Future members, Chairman Joe Smith, Vice-Chair Ben Simmonds and National Chairman of Wales, Mike Wallbank.